With almost perfect timing with the soon to be released exhibition at the Melbourne Museum, Tutankhamen and the Golden Age of the Pharaohs, King Tut's Curse by National Geographic is the perfect precursor to not only get a taste of the exhibition but learn the possible cause of one of the world's most famed pharaohs. Not only is it a great presentation but it's a documentary that can be watched many times without the information becoming too overbearing. Since Tutankhamen was discovered by Howard Carter on November the 22nd, 1922, a mystery revolved around the young King's death which also spawned the Hollywood cliché of the curse of the mummy. 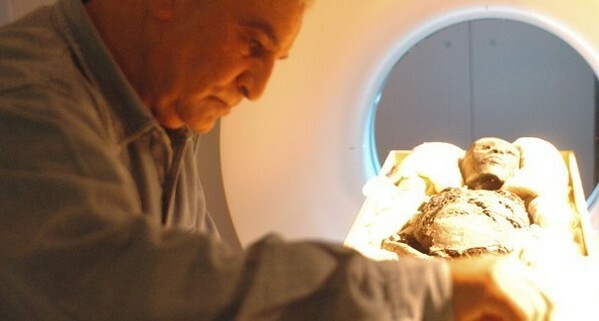 This documentary attempts to explain the many theories of his death byusing scientific evidence with the help of a CT-scan machine to not only see what the pharaoh may have looked like but finally give a definitive answer to his death. Another theme that runs through the documentary is the death of Lord Howard Carnarvon which may have been caused by ancient micro organisms or something far more sinister. 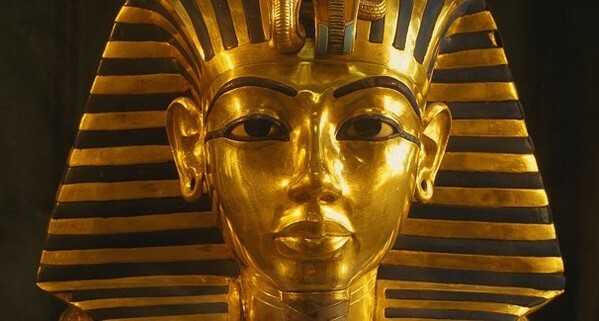 As Tutankhamen was most likely the son of Akhenaten, a pharaoh who attempted unify religion in Egypt, this was generally the theory behind the death of King Tutankhamen. 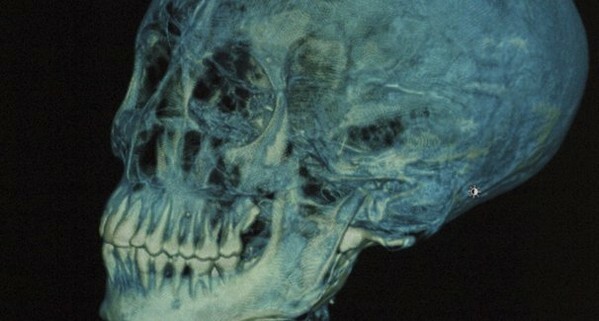 Revenge by the people or the priests for removing their gods, however as the documentary collects the scientific facts, we soon learn that that Tutankhamen had an oblong shaped head, a wisdom tooth growing on an angle, one leg longer than the other, damage to not only the skull but also other skeletons. The evidence slowly begins to add up, especially in relation to this death. Was it a battle with the Hittites or a chariot accident? The documentary attempts to dispel many of these myths and it appears that Tutankhamen was a slender, well fed Royal boy who unfortunately died from infection due a knee injury and not the mysterious theories of revenge or nefarious murders. King Tut was a normal boy who died in a time when medicine was quite limited and the documentary nicely finishes with the face of what Tutankhamen may have looked like... a face that is over 3,330 years old. This is a very insightful documentary from start to finish. 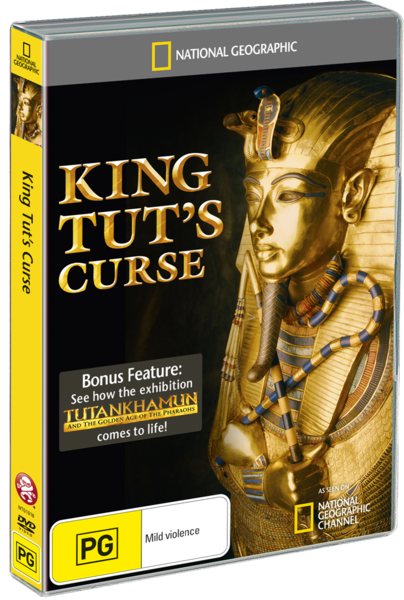 Presented in 16:9 widescreen, King Tut's Curse is unfortunately cursed with a considerably amount of grain throughout the DVD. Thankfully it does not distract too much with the amazing images of the boy king. Audio supports Dolby Digital 2.0 which sounds crystal clear and the presentation has a great soundtrack. For special features, there is a bonus segment (50 minutes) entitled Tut's Treasure Tour that is basically an snapshot of the upcoming exhibition, Tutankhamen and the Golden Age of the Pharaohs and how they managed to create one of the most popular exhibitions in museum history. Fascinating to say the least. If you're interested in ancient Egypt, than this is one documentary that we could happily recommend to your collection that actually gives a new light on the boy king plus an extra bonus feature on how they managed to organise the exhibition, Tutankhamen and the Golden Age of the Pharaohs.